Kelly Jensen posted a fantastic piece over at Book Riot yesterday that discussed why some well-intentioned initiatives to get kids reading are almost completely useless for children in poverty. 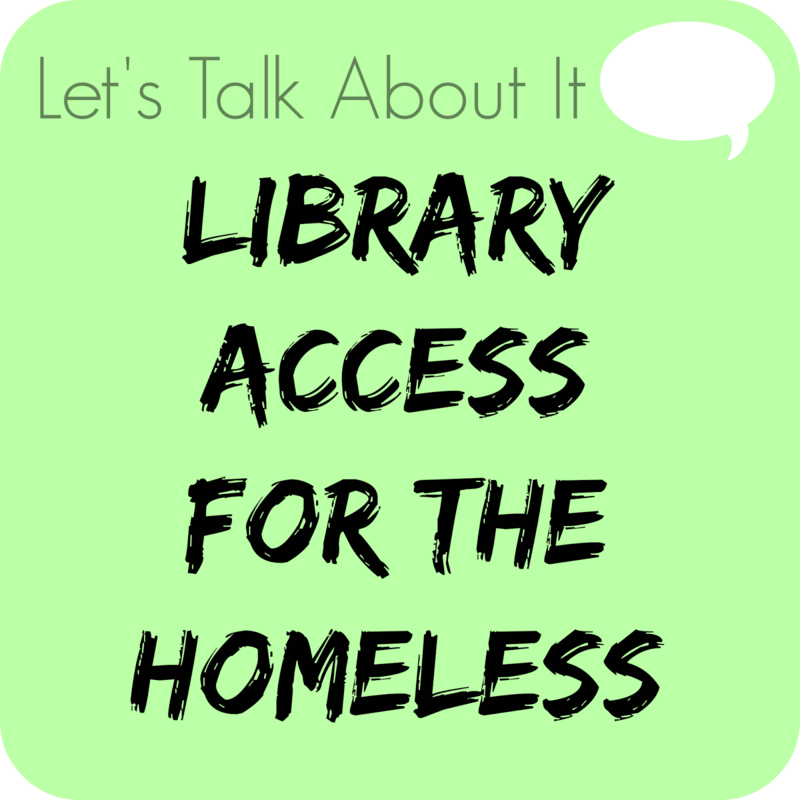 I almost gave myself whiplash from nodding along to Jensen's points, and it got me thinking about yet another significant segment of the population that gets screwed over when it comes to accessing library resources: the homeless. During my senior year in college, I interned for the National Runaway Safeline, a crisis hotline for runaway and homeless youth based in Chicago. Over ten months, I spent countless hours on the phone with children and teenagers looking for a place to sleep, a place to eat, or a safe place to get out of the cold. From my training there, I know for a fact that some libraries across the country serve as Safe Places; these are locations where runaway and homeless youth can go to find support and resources, such as information about shelters and food banks. However, I don't know how many of these libraries offer resource (e.g., book/computer) access to the chronically or intermittently homeless. I'd wager the number is pretty low. Sometimes these kids—and adults, too—want to do something besides just survive out there; libraries can make this a reality. I know some of my readers work in libraries, and I'd be especially interested in hearing about this issue from your end. Clearly, I don't understand all the inner workings of libraries. I know why cards matter—accountability for missing materials, calculating collection utilization and other statistics, etc.—but it's also painfully clear that they can be difficult to obtain and, thus, bar some people from accessing library resources. Have you ever had to deal with this, and, if so, what did you do? And, as always, I welcome thoughts from anyone else who'd like to weigh in! How can we ensure equal opportunity library access? Oh gosh, so many important points here, many I'd never thought about before. Our downtown library seems to do a pretty good job with this, but I'm not so sure about the other branches (could be totally wrong on that). I suppose the libraries themselves offer computer access (many do here in New York, at least), so perhaps it's a possibility. You're right, though...with every library that I've been to, proof of address has been required to obtain a card, and that's obviously not possible for the homeless unless shelters are allowed. Even then, shelters can be difficult places to get into, never mind live in. I think another aspect is that, when homeless or a runaway, entertainment can be the furthest thing from one's mind when trying to find out where to sleep or where the next meal is coming from. Books are a nice option is entertainment is sought after, but, as you point out, being homeless would pretty much exclude access to e-books, as devices that would allow for one to read e-books can be pricy and out of the range of the underprivileged/homeless. I suppose one option would be the thousands upon thousands of books that are thrown out. I've seen a few towns offer free public libraries in the form of a closed receptacle that can be opened. Such receptacle libraries operate on the kind of honor system, but if the books are going to otherwise be disposed of, is there really much to lose? Of course, that wouldn't allow the homeless or underprivileged access to, perhaps, more recent works. With every thing I can think of and every solution presented, I find a problem. ID would require an address. A card would require an address. E-book access requires pricy devices or, at the least, internet access which can be pricy in itself. The issue is multi-faceted and difficult to address, for sure. Then again, access to education and books is just a surface problem and only hints at underlying social issues that need to be addressed. Then again, I remember writing a paper on Needle Exchange Programmes and drug education programs. The author had written "no one wants their money going towards helping drug addicts get high safely." Of course, it's an entirely different debate, but NSPs help users use drugs safely, ultimately cutting down on disease that could spread through the community, never mind the financial costs of the disease. People are homeless for a variety of reasons...some are troubled and some are genuinely down on their luck. As for underprivileged youth, poverty is a massive problem, but, in New York for instance, so much money goes towards stupid projects in Manhattan instead of enriching the surrounding communities that very much fall under the jurisdiction of the city. Sorry...it's 3 am and I'm absolutely rambling. I'll try to clarify this later on. I wish I'd talked more about computer/Internet access in the original piece. As far as library computers, many of them require you to "scan in" or otherwise provide your library bar code for access. In the case that they don't, they're often on a strict time limit, and you may only be able to perform limited functions with them (print, etc.) rather than use them for freely (for research, homework, whatever). This is true for my local library, and a good friend of mine works in a library in Florida and told me this is the case at least where she works. Certainly, other libraries might have different policies, but this one seems fairly common. Certainly this is just one example, but I think access to books can provide people with hope in ways that just getting them their basic needs might not. Really good point on giving away books/free libraries. I think receptacles (maybe even Little Free Libraries) are potentially awesome routes for getting books into the hands of the homeless/poor. Also agreed on the fact that the money isn't going where it should and that this particular issue is just indicative of a larger underlying problem. On the topic of needle exchanges, I actually just this morning finished a really thoughtful book on the war on drugs, which also discusses how people don't want to fund drug users or addicts getting high safely when—ultimately—it might be the best way to get them clean and functional, whereas the drug war just perpetuates stigmatization and isolation. If you're interested, it's called Chasing the Scream by Johann Hari. Definitely worth a read. I'm glad to hear that your library does things well! Do you have any details on programs or policies they have in place that help them deal with this issue? Policies really do vary by library. For example, ours offers a temporary card for folks who can't prove state residency. We also have a public computer lab that gives out guest passes for people w/o cards. And of course people are always welcome to just hang out in the building. The residency requirement is complicated -- part of it has to do with patron accountability for materials, part of it has to do with funding/taxes, and part of it has to do with licenses for some of our resources. When serving the underprivileged, we have to balance what we would like to do with what is fiscally and legally possible for us to do... which of course varies from place to place. I keep up with Publishing industry news, and last week I came across an article about the President making an announcement concerning free ebooks for kids, and all the money and ebooks being offered up by publishers to do this, and my first thought was, "what about the kids who don't have computers or internet, or access to a library" My family wasn't even living below the poverty line, and yet there was never a computer in our home while I was growing up. Also, I often was in a situation in which it wasn't possible to get to the public library because of the distance, and my parents were both working. So, coming from that experience, and also finding out recently that there are still schools in the US that don't even have a library(!!! ), I wanted to scream about this political and publishing PR tactic of giving millions of dollars of free ebooks to kids. I would have applauded if they started a project to ensure that every school in America has a library. This is a really great argument. 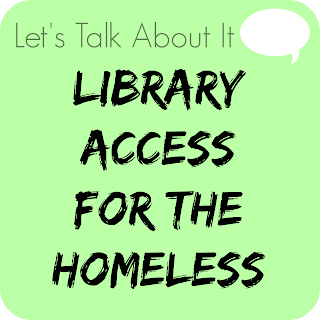 Honestly, I've never considered the situation before, but it would make sense that access to a library book (or the other resources offered by many libraries) could prove beneficial to homeless individuals. Obviously there are some questions that would need to be answered -- such as how to account for these individuals and their use within the tax base requirements set to provide funding for the library or how to ensure that books will be returned (along with the ability to have reliable location/contact information for late/fine notices), but development of programs for the homeless could be a wonderful thing. I can imagine that just the small comfort of having a book to escape into would be something that could make an otherwise awful situation just a little more tolerable. I completely understand that fiscal and legal concerns come into play with issues like this; I definitely don't think there's an easy or "one size fits all" solution. It sounds like your library, at least, has some awesome policies for folks without permanent residences. Yup! I think that's exactly the policy that Kelly over at Book Riot was lampooning in her piece. Obviously some are going to benefit from it, but to think that it's going to seriously benefit those in poverty or without the necessary technology is laughable. It seems like an easy way to say, "Hey, look, we're doing something for the underprivileged!" without making sure it's actually, you know, a USEFUL project. That's amazing about schools not having libraries! Do you remember where you found that out (article, book)? I'd really be interested in learning more! Yup, totally agree with your points here. Louise mentioned below that the funding situation does make things like this difficult. I imagine it's hard both from the perspective of helping determine future funding for the library (from usage statistics and such) and also having enough current funding to develop new programming! And definitely on your last point. Some of the testimonials I read in the toolkit from the ALA were so heartbreaking. It was a random article I came across maybe a month ago that was about how an inner city school in NY was finally getting its first library. I did a double take because I thought there was no way public schools didn't all have libraries, even if only a small one. How can we expect kids to get a decent education if they don't even have a library in their school?! One of the many grade schools I went to had 1st through 12th grade in one building and we still had a library.